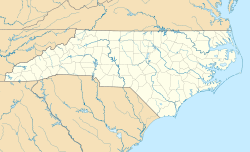 Joe, North Carolina, is an unincorporated community south-southwest of Hot Springs, in Madison County, North Carolina. The community is part of the Asheville Metropolitan Statistical Area. A post office called Joe was established in 1894, and remained in operation until 1953. Joe has the name of a female first settler. ^ Moyer, Armond; Moyer, Winifred (1958). The origins of unusual place-names. Keystone Pub. Associates. p. 71. This page was last edited on 15 January 2018, at 00:41 (UTC).